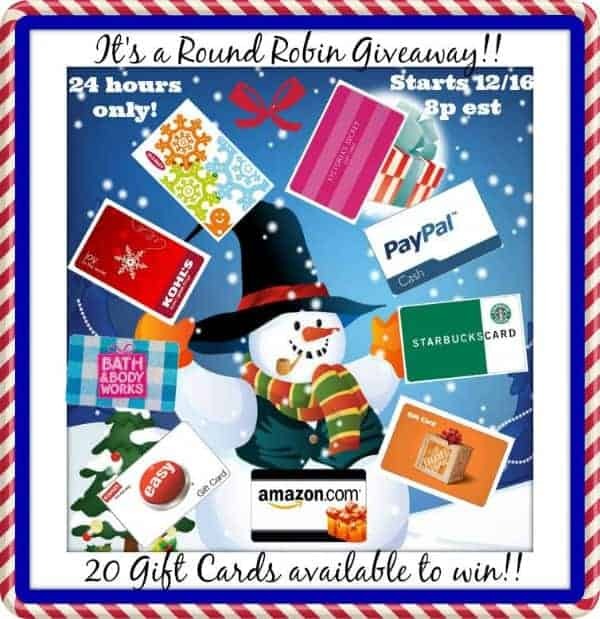 For the next 24 hours, I’ve teamed up with 19 other bloggers to offer our readers a Round Robin style giveaway! This is the first time that I’ve done one and I think it’s a pretty neat concept and hopefully one that you’ll find fun too! It’s posted over on my Facebook page, but I’m sharing it here just in case you missed it. Up for grabs on my page is a $20 Amazon Gift Card and open worldwide. It’s a really simple entry and then after you’re done entering on my page, I’ve linked to the next giveaway so you can hop from giveaway to giveaway and enter all 20 if you like. Visit this post on my Facebook page to enter. Hurry though since all the giveaways are only open for 24 hours and end tomorrow night (December 17th) at 8pm EST. It says content currently unavailable!! hopefully I can come back.